Located just a few kilometers from the Valnerina, occupying an impressive hillside position, Spoleto feels very civilized surrounded by a very rural backdrop. Midway between Rome and the late imperial capital Ravenna along the Via Flaminia, Spoleto was one of the few towns able to prosper in the twilight of the empire. Most famous for its famous Festival dei Due Mondi held every summer since 1957, Spoleto is often considered one of Umbria’s most graceful hill towns. Apart from the three week long festival of the arts, Spoleto also has a good collection of Roman and medieval attractions that ensure a visit anytime of the year will be enjoyable. The Umbri were the first to settle Spoleto, but it was soon taken over by the Romans who fortified the city walls by building an aqueduct across the gorge, serving as a foundation for the amazing Ponte dell Torri. Ancient churches set in and about Spoleto reflect the town’s importance during the early Christian period when it ruled over a large independent duchy. 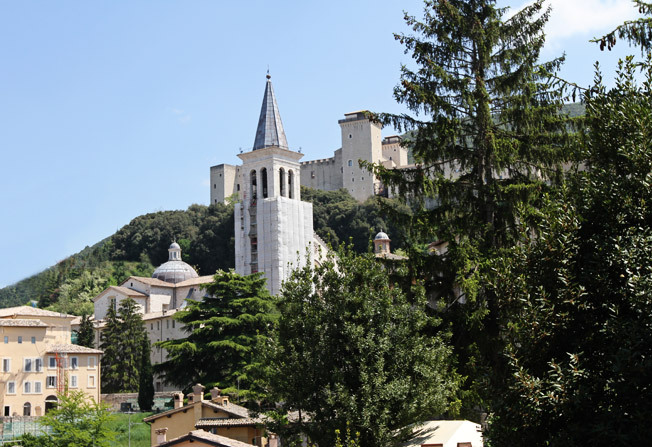 By the 14th century, Spoleto fell under church control, and the Rocca was built at its summit to enforce papal rule. How To Get To Spoleto – By car, Spoleto is on E45 and about a one hour drive from Perugia. From Perugia take the Assisi/Foligno exit and merge onto the SS75 until you exit at Foligno Est exit. Merge onto SS3 and follow signs to Spoleto. There are signs for various parking areas as you enter the town. By train, the main connections are from Rome, Florence, Perugia, and Assisi. The train station is an uphill 15 minute walk into town, so it is best to take a taxi from the station. Just over Ponte Sanguinario, the gateway into town, is Piazza Garibaldi, where you will find the Church of San Gregorio Maggiore. Originally erected in the 4th century outside the town, it was renovated in the 12th century. Through the gate are the ruins of the Ponte Sanguinario, or Bloody Bridge, which supposedly was named after the Christians martyred in the amphitheater. From Piazza Garibaldi along Via dell’Anfiteatro you will first pass the 2nd century ruins of the Roman amphitheater and then come to Via Cecili and San Nicoli, an imposing deconsecrated Gothic church that now is used for plays and concerts. If you arrive in Spoleto by bus or car, you are likely to end up at Piazza della Liberta. Across from the tourist office is the Roman theater built in the 1st century AD. It has now been restored to host concerts and ballets during the festival season. The nearby monastery of Sant’Agata, one of the oldest religious buildings in the city is the home of the Museo Archeologico Nazionale. The museum has many important pre-Roman finds along with busts of Julius Caesar, Augustus as well as other important Romans. Climbing up towards the older part of Spoleto, you will come to Sant’Ansano, a church built on the ruins of a 1st century temple. The church has a mixed history although some of what you see today was completed in the 18th century. Within the church, the 11th century crypt of San Isacco has stayed pretty much the same, and is decorated with frescoes in the Byzantine style. From Sant’Asano Via Arco di Druso you will enter Piazza del Mercato home of the 18th century Fonte di Piazza, a smaller version of Rome’s Trevi Fountain. Close by is Casa Romana, a Roman house dating back to the 1st century. According to legend, the home belonged to Vespasia Polla, the mother of the Emperor Vespasian. The home does display a look at what a noble Roman home would look like in that period, and some rooms have intricate mosaics. Not far from Piazza Mercato is Spoleto’s cathedral. Originally built and consecrated at the end of the 12th century, the cathedral is dedicated to Santa Maria Assunta and sits over the position of two earlier religious buildings. The facade of the church is 12th century Romanesque, that was lightened up by the addition of a Rennaissance loggia, eight rose windows, and a 13th century gold mosaic of Benedictory Christ. The original pavement dates from an earlier church that was destroyed by Frederick I. Above the entrance is Bernini’s bust of Pope Urban VIII who had the rest of the church redecorated in 17th century Baroque. The interior of the church is built on a Latin cross plan, and is divided into three aisles separated by a colonnade. Some of the more important works of art found within the cathedral include the series of rich frescoes of the Life of the Virgin by Florentine Fra Filippo Lippi. Other important works that should be noted are the Cappella del Vescovo Constantino Eroli which was built in 1497 and entirely decorated with frescoes by Pinturicchio, and the frescoes in the chapel alter niche depicting God the Father and Angels, The Madonna and Child, and John the Baptist. In Piazza Campello sits the 17th century fountain, the Macherone which has a huge face spitting out water from the Roman and medieval aqueduct. The monument on the square dates back to 1910 and was built to honor all of the Spoletines who fought to free Spoleto from the Papal State. La Rocca, a huge fortress sitting just above this monument was built on the orders of Cardinal Albornoz, as his personal headquarters at a time when the church considered Spoleto an outpost and was intent on conquering Umbria. A short walk from the Ponte dell Torri is the Church of San Pietro. The most impressive aspect of this church is the 12th century sculptures on it’s facade that are considered some of the finest Romanesque carvings in Umbria. Festival dei Due Mondi, the Festival of Two Worlds runs three weeks from the end of June to mid-July. It has been one of Italy’s leading arts festivals with music, theatre, and dance.